I had a really beautiful dream about my grandmother. I dreamt that I opened a door to a room filled with a mix of her belongings and toys from my childhood. It was really fascinating to revisit the memories of her bedroom, to open mahogany drawers filled with her linens, to see the flowers she embroidered on doilies and table runners. There was a shelf with my dolls and stuffed animals as fresh and new as the day they were given to me as a child. Keeping the memory of the dream with me throughout the day, I wanted to create a look with an antique feel. I started with Nubar Chiffon. 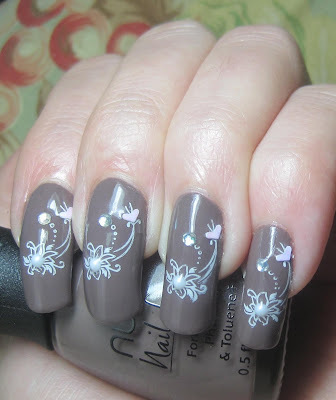 I stamped the flowers from plate M31 in Konad white special polish. I placed a pearl in the center of each flower, and a mirror rhinestone and white rainbow heart at the top of the design. Nubar Chiffon was perfectly opaque in two coats. The application was wonderful. Chiffon is an on trend taupe for fall. It has a purple undertone that would make it work with a variety of palettes. It's a classic, neutral shade worth owning. I hope you enjoyed my dreamlike manicure. Nubar Chiffon was sent to me for review. This polish, from the Finest Silks Collection, can be purchased at bynubar.com. The white rainbow hearts from Art Club Sprinkles. The pearls are part of the Bewitching Halloween Gems. These were provided for review and can be purchased at victoriasnailsupply.com. Konad plate M31 was provided for consideration. 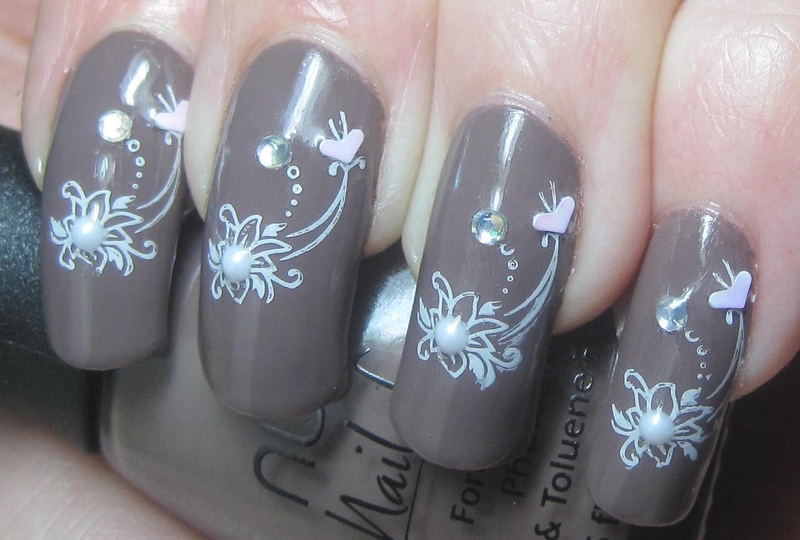 To see the full assortment of Konad nail art stamping products, please visit ocnailart.com. Would you like the chance to win your choice of eight Konad image plates? Stop by the Ladies' Choice of Eight Plates Giveaway to enter. Great manicure! Love the taupe in combination with the white flowers. What a wonderful dream and a great manicure! What a lovely dream - and a very fitting mani. What a nice colour and design! You just inspired me to repaint my nail again!! I love dreams like that. Especially when they inspire great art. Lovely nails - the really capture the antique look and feel, and are gorgeous! Lovely manicure and what a wonderful dream. I never have good dreams so you're very lucky. Great post! Beautiful! =] just like your dream!! so so so Elegant !!!!! I love this kind of color and with your stamp & accessories, it's very pretty !! Very feminine and delicate, yet unusual and trendy at the same time! I'm kind of afraid to break out the taupes myself for I'm sure I'd be bored with them the very next minute, but this looks absolutely stunning! Thank you for sharing. It is a lovely manicure. What a beautiful dream to have. It can be sad and happy at the same time. The manicure is just perfect. I love all the little details on your nails. The color is also delicious. It's a beautiful manicure for a beautiful dream. Spaceinvaders: Thank you! I love pairing taupe and white. A beautiful way to hold onto a beautiful memory. I think you've nailed the dreamy effect! It's very whimsical, I especially love the konad design. :) The colour is very nice too.